The name Land Cruiser has been around since 1954, and is synonymous with off-road prowess. The initials FJ make enthusiast’s eyes get misty, and create a longing for a vehicle from long-ago. The history and heritage of the Land Cruiser is irrefutable. It was the first vehicle to climb the 6th stage of Mount Fuji. The 40 series introduced in 1960, has become one of the most sought after and restored classic vehicles. It is the longest running nameplate in Toyota history, and is now in its 9th generation. Fast forward to today and the Toyota Land Cruiser is still a more-than-capable off-road monster. Packed with the latest in all-terrain endeavoring technology like: Multi-terrain select, Crawl Control, Bird’s Eye Camera, Multi-Terrain 4-wheel ABS, Kinetic Dynamic Suspension System, Downhill Assist Control, Hill Start Assist, and Off-Road Turn Assist and paired with a monster power plant: 381-horsepower 5.7-liter DOHC V8 engine, producing 401 lb.-ft. of torque. The 8-speed Electronically Controlled Automatic Transmission with intelligence (ECT-i) teams with a versatile full-time 4WD system, which uses a TORSEN limited-slip locking center differential and a 2-speed transfer case with selectable low-range. Adding to its prowess, Skid plates are used to protect its front-end suspension, radiator, fuel tank, and transfer case, and an advanced Multi-Terrain Monitor provides near 360-degree visibility in tight situations. A standard Trailer Towing Package allows the Land Cruiser to tow up to 8,100 pounds. The modern iterations of the Land Cruiser add a luxury interior to the rugged capabilities making it a true Renaissance Vehicle. A long list of comfort and tech features include: ventilated front seats, heated telescoping steering wheel with power tilt and memory, power moonroof, four-zone automatic climate control with 28 cabin air vents, and Smart Key keyless entry with push-button start. A 9-inch touchscreen infotainment system features JBL Audio with Integrated Navigation, 14 JBL speakers, split-screen capability, advanced voice recognition, Siri Eyes Free mode, SiriusXM Satellite Radio, Bluetooth® connectivity and music streaming, and Qi wireless phone charging. 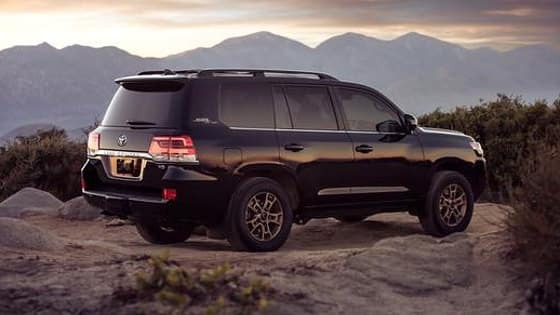 Now coming for the 60th anniversary of this legendary vehicle, the 2020 Heritage Edition Land Cruiser will honor the legacy of the name and celebrate its rightful place as the flagship of the Toyota line-up. Built in very limited numbers, it is only offered as a two-row model maximizing cargo capacity. Available in either Midnight Black Metallic or Blizzard Pearl, a black-accented grille and bronze-colored BBS 18 x 8.0-inch forged aluminum wheels featuring a “TOYOTA” center cap finish off the look. A vintage-esque Land Cruiser exterior badge finishes off the exterior dressing. Complementing its purpose-built 4×4 off-road focus, the normally standard running boards and chrome lower body side are deleted, while darkened headlight housings, fog lights with dark chrome surrounds and side mirrors with darkened chrome details give the vehicle the feeling of sophistication. Continuing the Land Cruiser’s amalgamation of luxury with capability, the Heritage Edition is solely furnished with black leather-trimmed upholstery. The bronze wheel color carries inside for the contrast stitching used throughout the cabin, including the steering wheel, door trim, center stack, console and seats. Finally, the Land Cruiser Heritage Edition features all-weather floor mats and cargo liner, so it’s ready to get out and have fun. 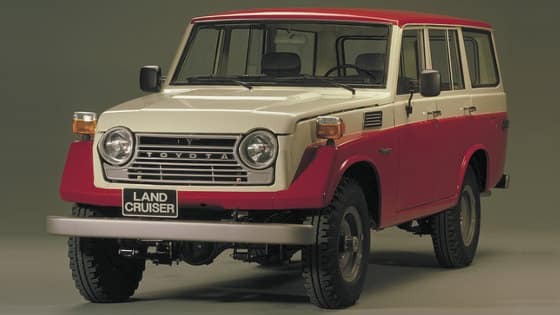 The name Land Cruiser is a nostalgia invoking name which carries with it images of prowess, iconic capability and most recently luxury and amenities. The Heritage edition carries all this into the next decade with aplomb. Have questions about the Toyota Land Cruiser? Ask Ross and then come on in a test drive one today.